BLOOMINGTON, Ind. 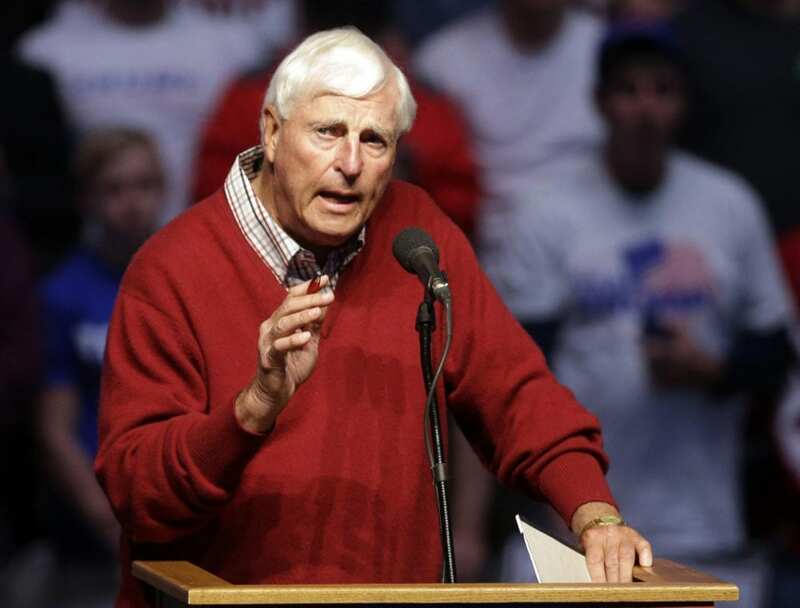 (AP) — Bob Knight returned to Indiana University on Saturday, the former basketball coach’s first public appearance on campus since he was fired almost 19 years ago. Knight returned to watch the Hoosiers’ baseball game against Penn State from the press box. The Big Ten Network was broadcasting the game when Knight made the impromptu golf cart ride to the field. Athletic director Fred Glass has repeatedly made overtures to bring back Knight. Each time Knight declined. The Hoosiers first attempted to make amends by adding photos of Knight inside Assembly Hall, the basketball team’s home arena. In 2009, the school inducted Knight into the athletic Hall of Fame, but Knight skipped the ceremony. He wrote a letter to Glass at the time, explaining he didn’t want to create a “media circus” that would distract from the other inductees. Knight also stayed away from the school’s 40-year reunion for his 1976 national championship team — the last unbeaten team in Division I men’s basketball — prompting many to wonder whether Knight would ever return to the university that made the former Ohio State player and Army coach a household name in basketball circles and beyond. It wasn’t immediately clear what prompted Knight’s change of heart. But there have been recent reports that the 78-year-old Knight has not been in good health. During a speaking engagement Thursday night at Center Grove High School on the south side of Indianapolis, The Indianapolis Star reported there were times he struggled with his memory. But Knight returning to campus was a welcome sight for longtime Hoosiers fans. Knight won a school record 659 games at Indiana (1971-2000) and retired as coach of Texas Tech during the 2007-08 season with a career record of 899-374 — the most wins by any major college men’s coach. He won 11 Big Ten titles while coaching the Hoosiers before he was fired in September 2000. School officials put Knight on a zero-tolerance policy earlier that year after video appeared to show Knight grabbing one of his former players — Neil Reed — around the throat. Reed died in 2012, at age 36, of a heart attack. Knight was later fired after an alleged confrontation with an Indiana student inside Assembly Hall. Following his tenure at Indiana, Knight was hired at Texas Tech where he went 138-82. He also was 102-50 at Army. Knight also was a backup on Ohio State’s 1960 national championship team. He was inducted into the Basketball Hall of Fame in 1991 and the College Basketball Hall of Fame in 2006. Be the first to comment on "Knight Makes 1st Return Trip To Indiana Campus Since Firing"